It’s not too often that the cheapest and stingiest choice ends up being the most enjoyable, but such is the case with Nissan’s Micra. Cheap? How does $10,488 sound? If you were in the market for this little city car last year it probably sounds $500 too high, because the Micra was one of Canada’s only new sub-$10k cars for its entire four-year existence (except for the $9,995 Chevy Spark and Mitsubishi Mirage when it went on sale to clear out end-of-year stock), but thanks to a new standard 7.0-inch centre touchscreen featuring an integrated backup camera and some other updates, it’s a bit pricier this year. You can see all of the trims and check out previous years’ pricing right here at CarCostCanada, where you’ll also find manufacturer rebate info and dealer invoice pricing. Its new list price still beats inflation (according to the Bank of Canada inflation calculator), as well as the Mirage by $510, and now that I think of it the Micra also beats the Mirage by 31 horsepower, 33 lb-ft of torque, 400 cubic centimetres of engine displacement, one cylinder, one rear suspension stabilizer bar, one-inch of standard wheel diameter, 20 millimetres of standard tire width, 32 litres of additional passenger volume, 41 mm of front headroom, 29 mm of rear headroom, 0.5 inches of standard centre touchscreen, six litres of fuel tank volume, and the list goes on. All said it would be unfair not to mention that, while the Mirage is about as sporty as a Kenmore dryer on spin cycle, its claimed fuel usage nears hybrid levels of efficiency at 6.5 L/100km combined city/highway in manual form and just 6.2 with its optional continuously variable transmission (CVT), compared to 7.9 L/100km for the Micra’s five-speed manual and 8.0 for its available four-speed automatic. The Mirage beats the Micra in a number of other notable ways too, such as standard auto off headlamps, LED taillights, body-colour mirror caps, exterior door handles and liftgate handle, a chrome rear garnish, standard power door locks with remote access, power-adjustable side mirrors, powered front windows, air conditioning, Apple CarPlay and Android Auto smartphone integration, two more standard stereo speakers, a driver’s knee airbag, 79 additional litres of cargo capacity behind the rear seats, 511 more litres of cargo space with the seats folded, two more years or 40,000 more kilometres of basic warranty, five more years or 60,000 more km of powertrain warranty, etcetera, while year-over-year sales of the Mirage were off by just six percent compared to 39 percent for the Micra. That last point might make it look as if more people like the Mitsubishi, but just 2,351 Canadians took a Mirage home last year compared to 5,372 that opted for the Micra. It’s easy to see they didn’t make their choice by comparing standard features and fuel economy, because the Mirage clearly comes out on top in these categories, so why all the Micra love? Take both cars for a drive and you’ll immediately understand. The Micra is so much fun you’ll be wondering why everyone’s making such a fuss about SUVs, whereas the Mirage feels best when idling in bumper-to-bumper traffic. If the latter describes your commute and you never plan on driving up to Whistler or Kelowna via the Coquihalla for a weekend getaway, by all means go all in on the Mitsu, but if you want a car that has the power to keep up with traffic while climbing steep grades, let alone is sporty enough in stock trim to compete in its own spec racing series, choose the Micra, and while you’re at it watch a few segments of the highly entertaining Micra Cup (see below for Race 1 of the 2018 season). Rather than applying lipstick to a pig and trying to pass it off as the prom queen, Nissan invested its Micra money into a formidable direct-injection 1.6-litre four-cylinder engine good for 109 horsepower and 107 lb-ft of torque, compared to 78 and 74 respectively for the Mirage, plus a sporty feeling five-speed manual transmission with nice, progressive clutch take-up, wonderful steering feel, a front strut, rear torsion beam suspension with stabilizer bars at both ends, 15-inch wheels on 185/60 all-season tires, and overall driving feel that punches way above its 1,044-kilo welter curb weight. Of course, how a city car takes to the corners may not matter as much to some folks as others, but let me know how you feel about that after you’ve just managed to avoid an accident thanks to the fleet footedness of your much more agile Micra. Due to such well-engineered suspension systems, I’m thankfully able to share a number of near misses that could have been bent metal at best, so handling is as much of a safety issue as braking performance, which I must say is pretty good on both cars despite their front disc, rear drum setups. I know, many buying into this class will likely care more about colour choices and styling than performance and safety, and when it comes to visual appeal I think the Micra has an edge in this respect too. While both are quite seasoned, this generation of Mirage Hatchback having arrived on the scene in 2012 and the current Micra in 2011, albeit in Canada during the spring of 2014 as a 2015 model, the little Nissan looks well proportioned and actually quite sporty from all angles. Inside my base S trimmed tester, the word spartan comes to mind. Maybe minimalism might be kinder, because it does brighten things up with silver metal-like accents in key areas, and a nice, sizeable 7.0-inch centre touchscreen filled with a colourful interface, this especially true when placing the shifter in reverse and enjoying the big new backup camera on the display, while Bluetooth audio, Siri Eyes Free, and plenty of other functions provide a fully up-to-date user experience, but the black cloth seats come up a bit short on creativity, and the three-dial HVAC system is, while perfectly functional, easy to use, and adorned with blue and red highlights on the temperature knob and some backlit orange elements elsewhere, hardly exciting. The steering wheel is new, and in its most basic form gets a fresh set of metallic silver audio system and Bluetooth phone switchgear on its leftmost spoke, but the two-dial gauge cluster hasn’t changed for as long as I’ve been testing this car, my first review being a 2015 version of this very Micra S, with its only option being a sparkling coat of Metallic Blue paint. This 2019 tester’s $135 worth of Magnetic Gray paint aside (the price of optional paint hasn’t gone up one cent), the gauge package is large and easy to read in any light, while the little LCD gear selector, odometer, fuel gauge, and trip computer display, capable of showing current and average fuel economy plus distance to empty) is kind of cool in a retro Seiko digital watch sort of way. I reviewed 2016 and 2017 examples of the top-line Micra SR too, the former in a beautiful blue-green Caspian Sea hue (that’s still available), and the second in a less playful Gun Metallic grey (that’s been replaced by this car’s aforementioned Magnetic Gray—Metallic Blue is now only available in upper trims, incidentally), but Charcoal Cloth (black) is the only interior colour choice, albeit upper trims get some patterned colour woven into the seat inserts that’s a big move up in visual stimulation. What else do you get with the base Micra? 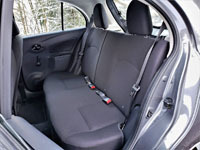 The new infotainment system and steering wheel switches aside, the Micra S comes with thoughtful little luxuries like rubberized knobs for the manual winding windows, cool little toggles for manually adjusting the side mirrors (although you’ll need to stretch across the car or ask for help to set up the one on the passenger’s side), carpeted floor mats front to back, and did I mention the genuine cloth seats? Of course, I’m poking a little fun at the expectations of our first world life, because very few cars available on the Canadian market have wind-up windows these days, let alone require a key to get into each front door as well as the rear hatch. Seriously there’s not even an interior latch to remotely release it, but once it’s unlocked you have the luxury of opening and closing it at will. Standard features of note that have not yet been mentioned include tilt steering, micro-filtered ventilation, variable intermittent wipers, an intermittent rear wiper, two-speaker AM/FM/CD/MP3/WMA audio with Radio Data System (RDS) and speed-sensitive volume control, a USB port and aux-in jack, a four-way manual driver’s seat, 60/40 split-folding rear seatbacks, and more. If you want air conditioning and/or cruise control, not to mention an upgraded steering wheel featuring switchgear on its right spoke, simply opt for the Micra S with its available automatic and these features come standard. That upmarket move requires a surprisingly hefty $3,810 resulting in a new total of $14,298 before freight and fees, which, once again to be fair to the Mitsubishi, is $2,100 more than the Mirage CVT that already includes the autobox-infused Micra upgrades as standard. The thing is, you’ll be hard pressed to get up a steep hill in the Mitsubishi, while you’ll be hard charging in the Micra. The fancier cloth isn’t all you get when moving up from the Micra’s base S trim to its $15,598 mid-range SV or $17,598 top-tier SR grade, with the former trim’s standard features list swelling to include the automatic transmission, body-coloured mirror caps and door handles, power locks with auto-locking, powered windows, heated power-adjustable side mirrors, chrome interior door handles, cruise control, air conditioning, four-speaker audio, a six-way manual driver’s seat with a folding armrest, etcetera, while factory options for this trim include a $400 SV Style Package with 15-inch alloy wheels and a rear spoiler. The top-line Micra SR gets the same rooftop spoiler and its own set of aluminum wheels, although its standard machine-finished rims grow to 16 inches and ride on 185/55 all-season rubber, while the rest of its standard features list includes upgraded sport headlights and taillights, front fog lamps, side sill spoilers, chrome exterior accents, a chrome exhaust tip, a leather-wrapped steering wheel, a leather-wrapped shift lever with the manual transmission (which once again comes standard), even nicer Sport cloth upholstery, and more. Paint colours aside there aren’t any factory options for the Micra’s two upper grades, but Nissan provides plenty of dealer-installed accessories no matter the trim, and some really celebrate the car’s sporty nature. For instance, there are Colour Studio packages that include contrasting coloured mirror covers and sport stripes available across the line for $219, or alternatively you can swap out the body-colour door handles on SV and SR models with the same contrasting colour from the aforementioned City Package by choosing the $461 Trend Package, while the $599 Intensity Package ups the ante with a contrasting coloured rear hatch finisher and a custom “Premium Package” emblem. Alternatively you can get all of the above individually, as well as colour centre wheel caps, a rear rooftop spoiler (for S and SV trims), a chrome exhaust tip (ditto), etcetera, plus a whole host of more conventional accessories like all-season floor mats, a cargo mat, bicycle and ski/snowboard/wakeboard carriers, and more. I should mention that the Micra and Mirage aren’t the only hatchbacks vying for your attention in this class. As noted earlier, Chevy’s little Spark is also a credible competitor for about $500 less than the Micra, while it bridges the gap (more like a chasm) when it comes to performance thanks to 98 horsepower and 94 lb-ft of torque (still 11 hp and 13 lb-ft less than the Micra), and fuel economy that’s rated at 7.2 L/100km combined, plus it offers an identically sized 7.0-inch touchscreen with standard CarPlay and Android smartphone integration, etcetera. It was redesigned for 2019, which spurred the strongest year-over-year growth within Canada’s entire small car sector (including larger subcompact and compact models) at 24.2 percent, resulting in 4,945 units and second place in the city car segment. At the other end of the positivity spectrum Fiat’s much pricier $22,495 500 lost even more ground than the Micra at -68 percent and just 269 units down the road during the same 12 months—year-over-year Micra sales were down 39 percent, incidentally. The Smart Fortwo, which doesn’t really face off directly against any of these five-place competitors due to having just two seats, now being solely electric and thus starting at $29,050 and wearing a new EQ badge, saw its sales shrink by 13.9 percent to 317 units last year, while the entire city car segment has been contracting in recent years due to the cancellation of the all-electric Mitsubishi i-MiEV last year and the Scion iQ the year before. Glancing back at that list of rivals and it’s not too unreasonable to surmise some future cancellations. Truly, if it weren’t for Daimler’s brilliantly innovative Car2Go sharing program (it was first) it’s highly unlikely the Smart brand would exist anymore, at least in our part of the world, while both Fiat, which is repositioning itself as a boutique premium brand like Mini, and Mitsubishi, that’s only having any notable success with Outlander compact SUV that saw growth of nearly 50-percent last year due to a plug-in hybrid version, may not make it through the next inevitable recession. I mean, if Fiat only managed to sell 596 vehicles brand-wide up until October of 2018, which is a 73 percent drop from the year prior, and then conveniently forgot to mention the brand in its monthly and yearly totals in November and December, there’s a pretty good chance they’re about to say arrivederci to the North American markets sooner than later. We sourced the information from Automotive News Canada that reported 645 calendar 2018 sales for a 72.4 percent downturn compared to the 2,339 units sold in 2017, but that’s still got to be beyond challenging for the Italian brand’s 55 independent retailers. I’ve driven all of the above so therefore it’s easy for me to understand why the Micra is Canada’s best-selling city car, not to mention more popular than plenty of other small cars including the Mini Cooper at 4,466 units, the Honda Fit at 3,520 (although a flood at its Mexican assembly plant was the cause of its 29.9 percent downfall), Chevrolet Sonic at 2,836 (which will soon be discontinued), Volkswagen Beetle at 2,077, Ford Fiesta 1,323 (also cancelled), and Hyundai Veloster at 1,077 units (but it’s more of a niche sport model). I’m not saying this final list of cars aren’t more appealing than the Micra overall, but when value is factored into the mix, only the Honda Fit measures up. While we most likely won’t see a redesign of our Canadian-exclusive Micra anytime soon (most other markets received an all-new Micra in 2017), because it’s not available in the U.S. and therefore may not warrant the investment, it’s possible that a change in market conditions could see it quickly become even more popular than it already is with price- and interest rate-sensitive first-time and fixed-income buyers. Still, as much as I’d like to get my hands on the more up-to-date version, the current Micra offers so much value for its asking price and provides so much fun at the wheel that it’s impossible to beat, and now that Nissan has given this base model new life with a fresh infotainment touchscreen it’s even better than ever, putting the new 2019 Micra S high on my budget conscious shoppers recommendations list.